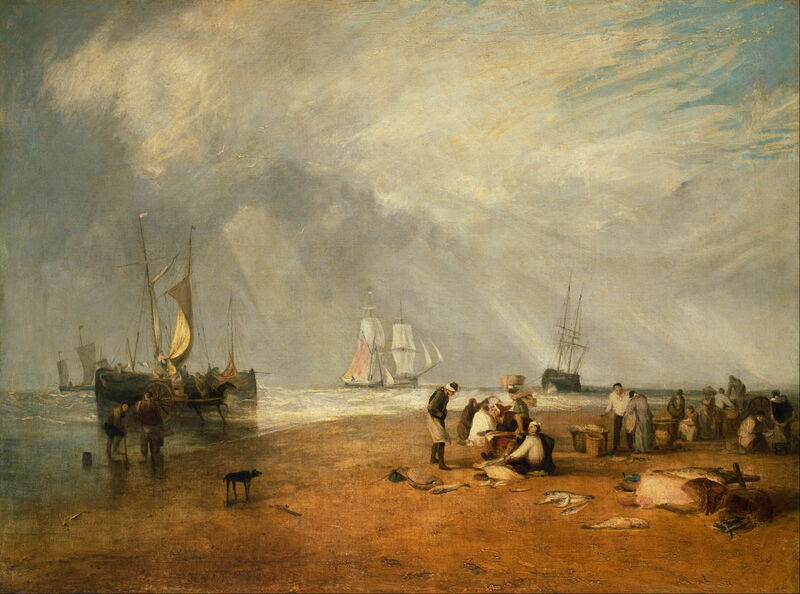 Joseph Mallord William Turner (1775–1851), The Fish Market at Hastings Beach (1810), oil on canvas, 90.8 x 120.7 cm, Nelson-Atkins Museum of Art, Kansas City, MO. Wikimedia Commons. 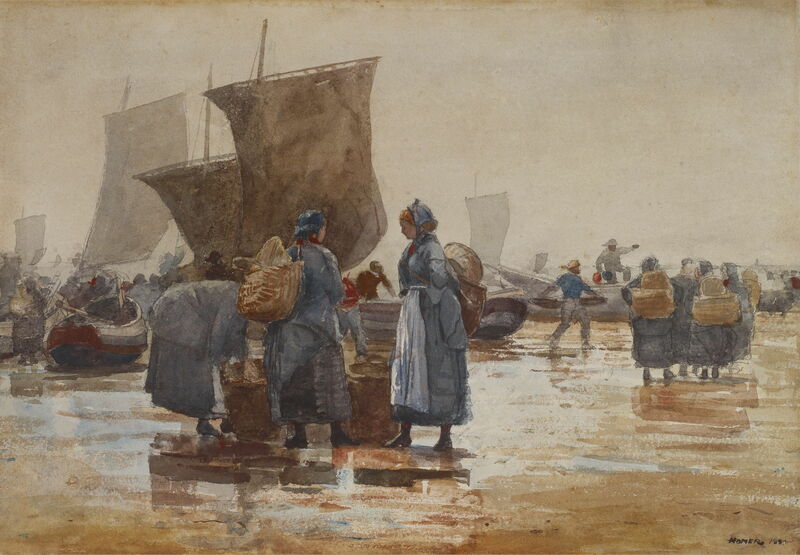 In the first of these two articles, I looked at paintings of fishing boats at work on the coast, and some of the difficult conditions in which they worked. Having got back to port, or to the beach from which they operated, the next task was to get their catch ashore. These days, with larger vessels, docks, and cranes, this is much less of a challenge than it used to be. When Turner was painting his way around the British Isles at the end of the eighteenth century, many boats had to be brought up onto a beach, as he shows in Fishermen Hauling a Boat through Surf on a Windlass (1796–7). Turner probably saw this at Margate, and it is one of a group of paintings he made in pencil, watercolour, and ‘body colour’ (gouache) showing coastal scenes. The people at the left are walking around the windlass, using it as a winch to draw the lines attached to the boat. Two of the fisherwomen are in the centre, ready with baskets to carry the catch ashore, and two men are down in the surf, handling the boat. Joseph Mallord William Turner (1775–1851), A Coast Scene with Fishermen Hauling a Boat Ashore (‘The Iveagh Sea-Piece’) (c 1803-04), 91.4 x 122 cm, location not known. Wikimedia Commons. 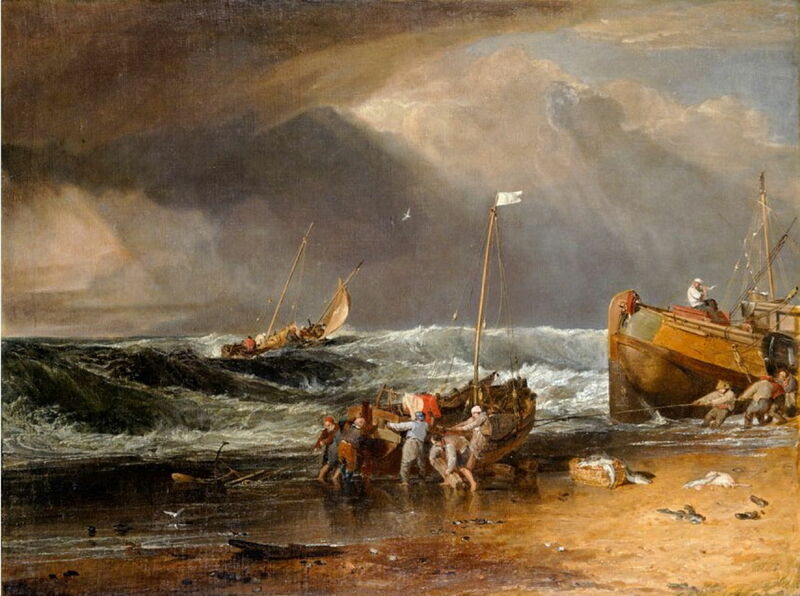 Turner’s later oil painting of A Coast Scene with Fishermen Hauling a Boat Ashore, sometimes known as The Iveagh Sea-Piece, from about 1803-04, shows more improvised methods in stormier conditions. Their catch has already been landed into a large basket, still sitting on the beach, as they try to drag and manhandle their boat with large logs as rollers. Turner uses shafts of sunlight to heighten the dramatic effect of the painting. This was one of a large collection of fine paintings assembled by Lord Iveagh during the late nineteenth century, which was bequeathed to the nation in 1927. It is normally on display in Kenwood House, London, which Lord Iveagh bought in 1925. Sun rising through Vapour: Fishermen cleaning and selling Fish, which Turner painted before 1807, shows how effectively his work must have inspired Monet and Pissarro when they stayed in London during the Franco-Prussian War. With the sun rising and slowly dispersing banks of fog, larger ships in the distance are emerging and taking form. In the foreground, three fishing boats are discharging their catch. Around the boat on the beach, fish, mainly flatfish like skate, is already being cleaned and offered for sale. Four people are sat around an improvised table, apparently having breakfast and talking. 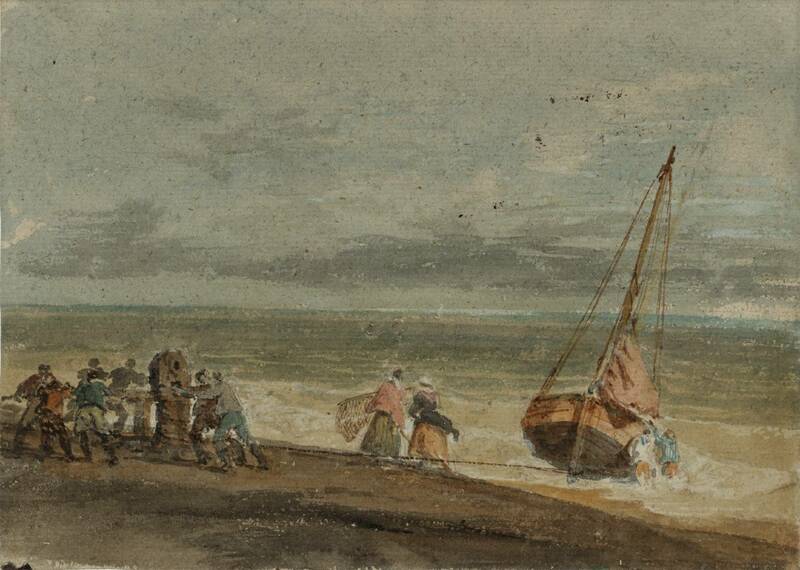 The Fish Market at Hastings Beach (1810) shows a similar scene at Hastings, on the south coast of England, with a horse and cart taken out into the sea to carry the fresh fish ashore. 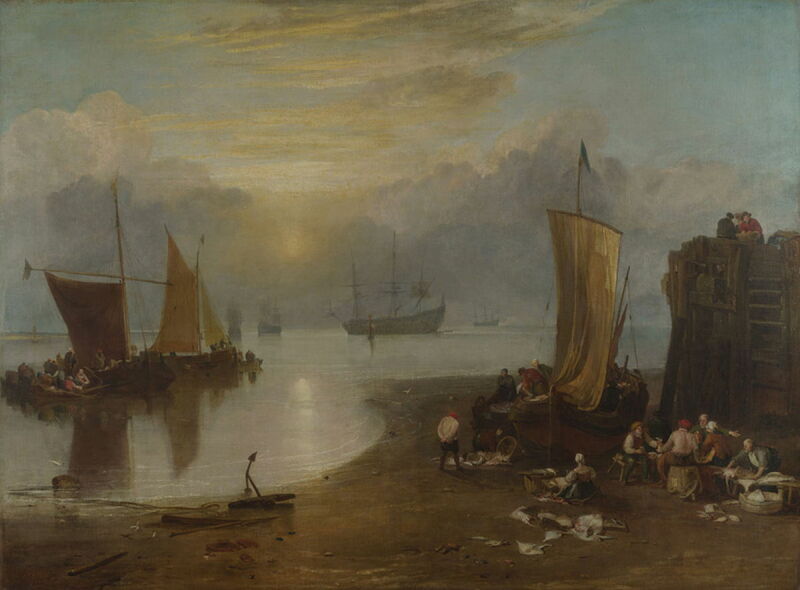 As Turner’s later seascapes took more to the open sea, rather than the coast, the young Richard Parkes Bonington (1802–1828) was starting to paint coastal scenes in northern France. 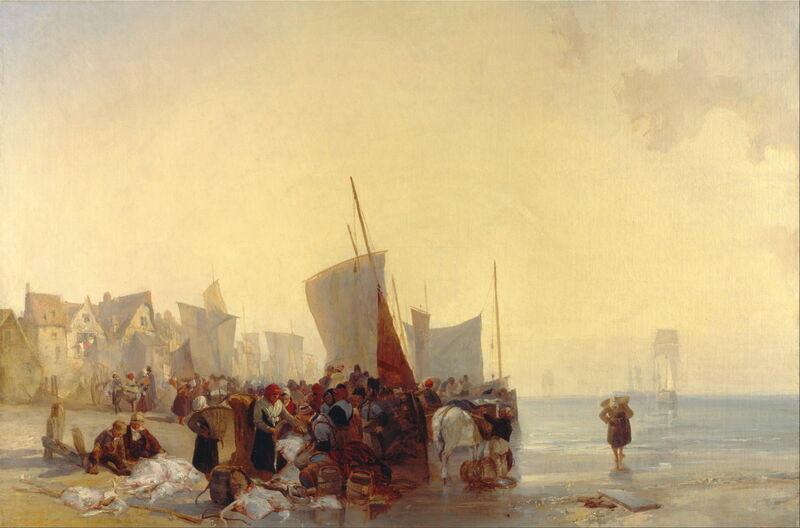 Early one morning on the beach near Boulogne, he saw a far larger and busier fish market, which he painted as A Fishmarket near Boulogne (1824) — one of the finest works of his brief but brilliant career. Once the catch is ashore and sold, the fishermen and their families get on with the task of preparing their boats for the next trip. 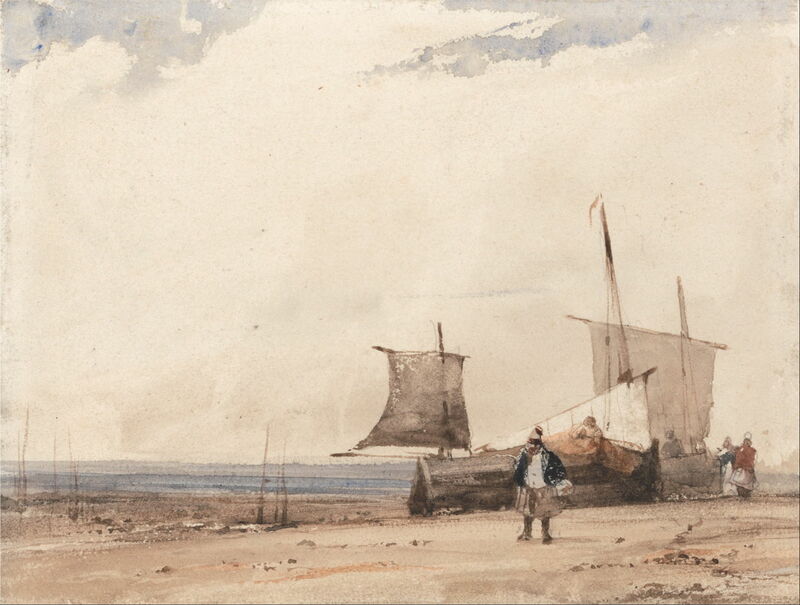 Bonington’s Fishing Boats Aground (c 1823-4) shows the tide far out, and the beached boats undergoing maintenance. 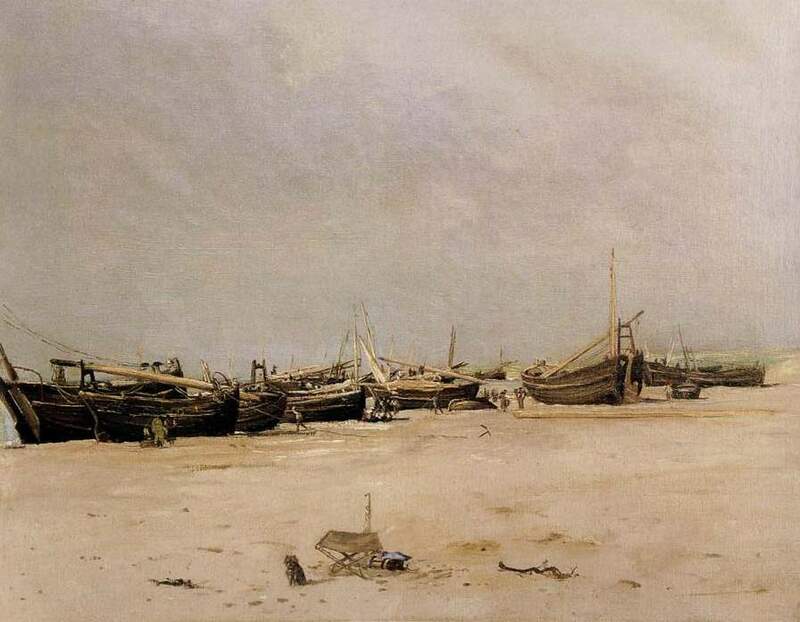 The stepped masts of the boats on the beach at Berck in Lepic’s La plage de Berck au pliant (1877-9) indicate that these vessels are out of service, perhaps a sign of the difficult times following the Franco-Prussian War. Lepic shows what may be the artist’s folding stool in the foreground, with a forlorn cat sat by it. Shortly after Lepic painted that, the American artist Winslow Homer (1836–1910) arrived in England, on his way to stay in the fishing community of Cullercoats, on the north-east coast. 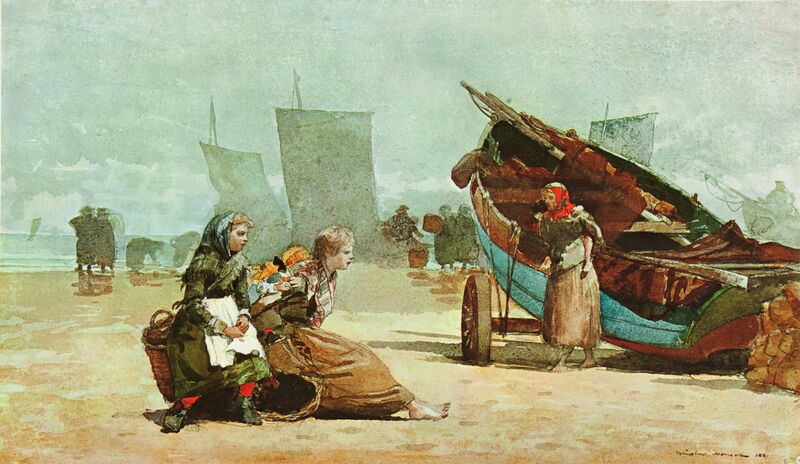 His large series of watercolours showing the people of Cullercoats includes several views of the beach there when the boats had come in, including those above and below. The women were responsible for loading the catch into their baskets, and carrying them up the beach to carts, which would transfer them a few miles to the nearest fish market. Meanwhile, the men removed their fishing gear from the boats, taking it back to their homes, then prepared their gear, clothes, and boats for the next trip. Nets and other gear were repaired and prepared by the women while the men were at sea, enabling a quick turn-around and minimising the time the fishermen spent ashore. Claude Monet (1840–1926), Étretat, the Beach and Porte d’Amont (1883), oil on canvas, 66 × 81 cm, Musée d’Orsay, Paris. Wikimedia Commons. 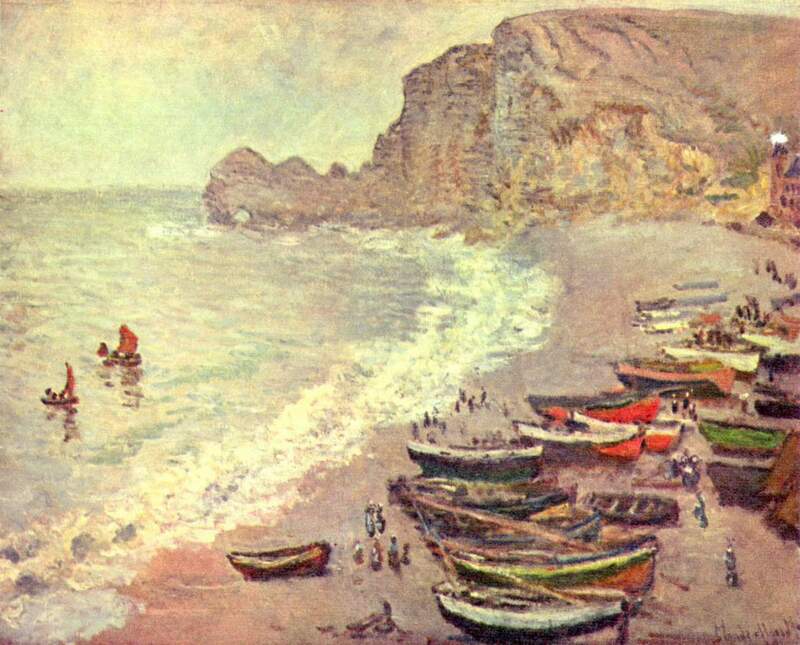 Shortly after Homer left Cullercoats, Claude Monet made one of many visits to his local cliffs near Le Havre, and there painted the brightly-coloured fishing boats hauled up onto the beach, in his Étretat, the Beach and Porte d’Amont (1883). Monet doesn’t seem to have painted a fish market – that of Le Havre was probably indoor and large – but the virtuoso Swedish painter Anders Zorn (1860-1920) did when he visited Saint Ives, in Cornwall, England, early in his career. 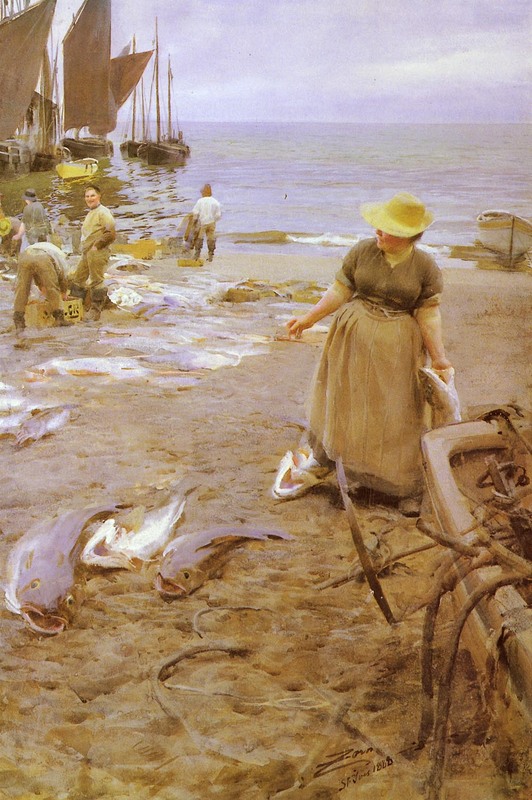 Anders Zorn (1860-1920), Fish Market in Saint Ives (1888), watercolour, 100 x 76.5 cm, Private collection. Wikimedia Commons. One of the fisherwomen is offering large fish from her small pitch on the muddy beach, as the fishermen behind are still sorting through their catch. 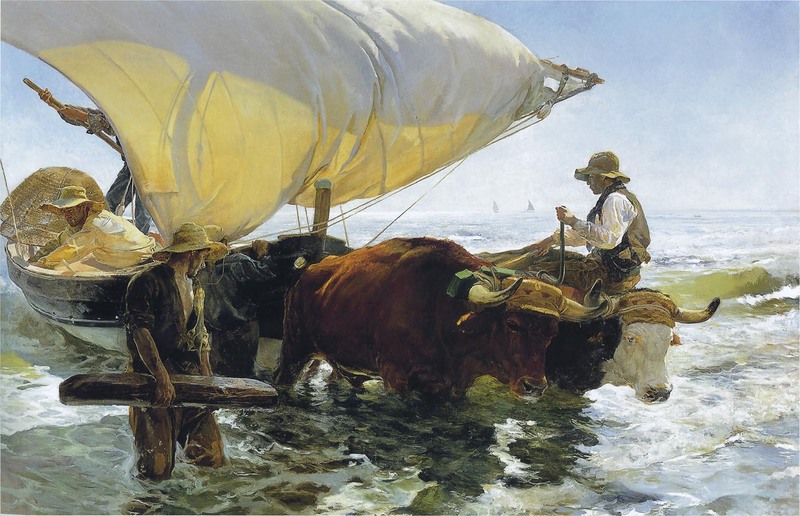 Towards the end of the nineteenth century, it was Joaquín Sorolla who painted the most evocative scenes of fishing boats arriving off the beach of his native Valencia, and being hauled out of the water by teams of oxen. The fishing industry around much of the coast of Europe started to change with the turn of the century. Huge fleets of small wooden sailing boats were replaced by larger steam-powered vessels with steel hulls. Because these ships were more expensive to build, they worked harder and longer. Changing fish stocks took these powered fishing boats further offshore, and their larger catches were handled in ports with centralised fish markets and railway services. The coastal scenes which had been painted by Turner, Bonington, and Homer faded into memory. By the start of the Second World War, the only time that an artist painting on the coast was likely to see a fishing boat was when it was alongside, in harbour. The Neo-Impressionist Paul Signac (1863-1935) moved to Saint-Tropez in the south of France in 1898, as Divisionism was waning. Although he continued to paint Divisionist or ‘pointillist’ works for many years, he also took to sketching views using watercolour and crayons. 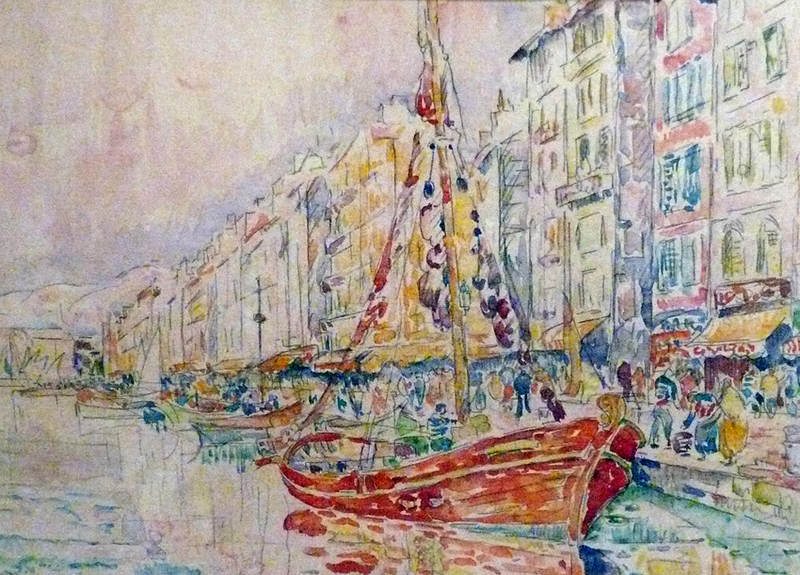 In these dazzlingly high-chroma works, he often showed fishing boats moored alongside, as shown above in Marseilles, and below in Ajaccio on Corsica. 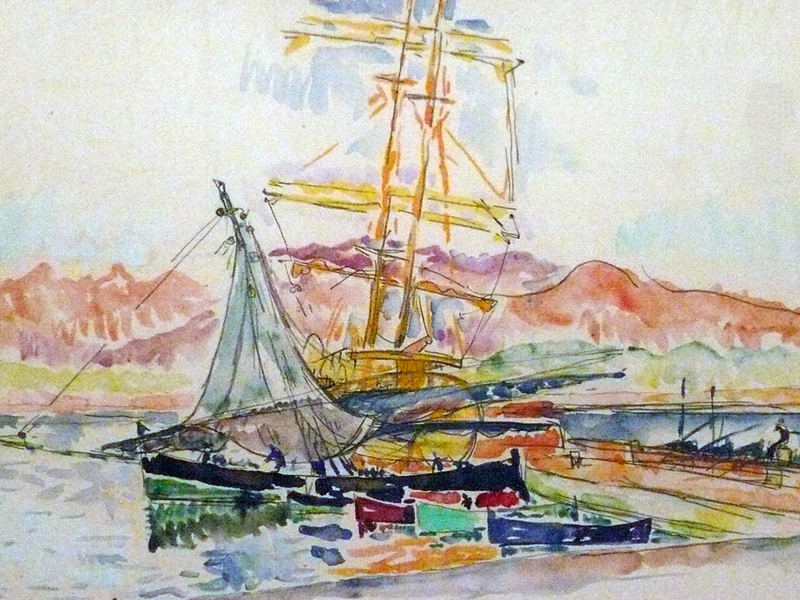 Paul Signac (1863-1935), Corsican Landscape (Ajaccio) (1931), watercolour and graphite, 28 x 43 cm, Musée National d’Art Moderne, Centre Pompidou, Paris. WikiArt. 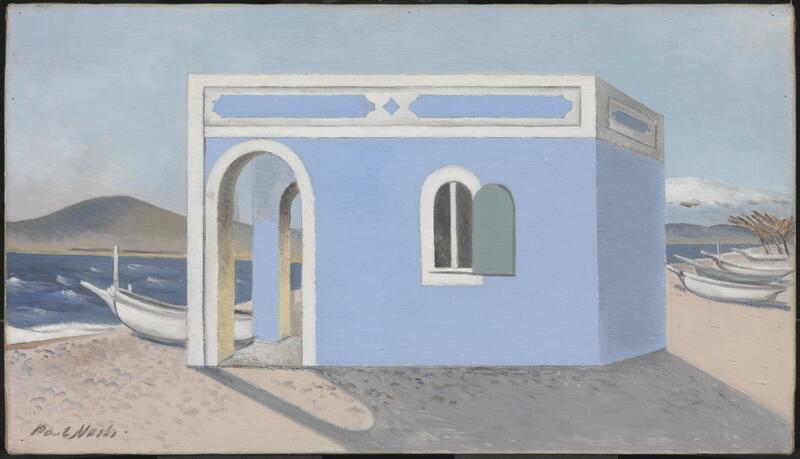 My final example also shows fishing boats on the Mediterranean coast of France, here in one of Paul Nash’s early surrealist paintings, Blue House on the Shore (c 1930-31). As painting moved through the many phases of modernism, so the coastal fishing industry, which had supported local populations since long before the earliest human art, slowly vanished. Posted in General, Life, Painting and tagged Bonington, Homer, landscape, Lepic, Monet, Nash, painting, Signac, Sorolla, Turner. Bookmark the permalink.